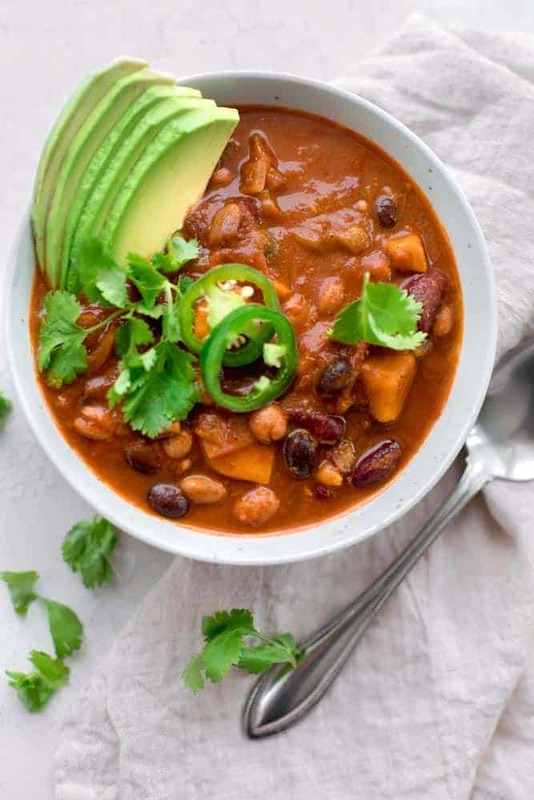 This Sweet Potato Chili is basic in ingredients but sophisticated in flavor - it has a sweet smoky flavor & packed with a healthy dose of protein and fiber! By now you’ve probably gotten the hint that I love sweet potatoes! They have a low glycemic index so they give you that carb satisfaction without raising your blood sugar to the roof. Sorry to start out so medical on you with this blog post, but it’s the down and dirty of why I love sweet potatoes so much. And that’s why instead of using beef to make chili, I’ve created this sweet potato chili. 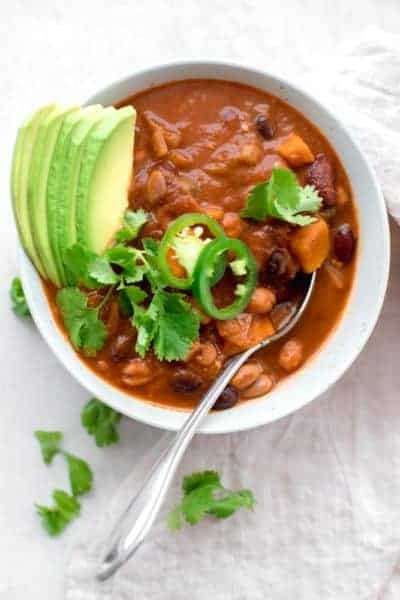 After you read the ingredients and nutrition facts and taste a bowl of this, you’ll certainly jump on the sweet potato chili wagon too! 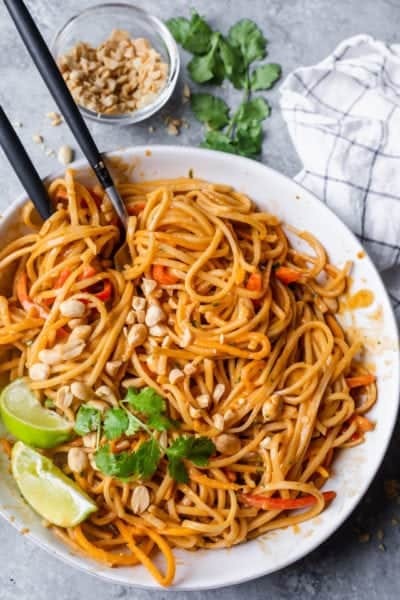 This recipe is dairy-free, grain-free and sugar-free. But it’s full of flavor, full of protein and full of nutrient dense foods! I like to simplify recipes whenever possible. So there’s a lot of chopping that happens to prepare for this recipe. But otherwise it pretty much just all goes in a pot in three stages. I start out with red onions, chopped sweet potatoes, green peppers and garlic with olive oil. Once the vegetables soften, the second phase of ingredients that go in the pot are the spices. And this step is the most important I think! When it comes to chili, the more spices the merrier, so pile on that smoked paprika, cumin, chili powder and oregano because it’s about to spicy up in here! All those spices simmering with the vegetables gives it a deep smokey flavor that feels so heart-warming and so comforting, whether you’re vegetarian or not. Next in the third phase of the throw-in-the-pot sweet potato chili making process is to add the broth, tomatoes, chilis and beans. I use a mix of kidney beans, pinto beans and black beans. You can use any combination of these beans or just one kind of you prefer. All that is going to cook for half an hour until your house smells like a chili cook-off! 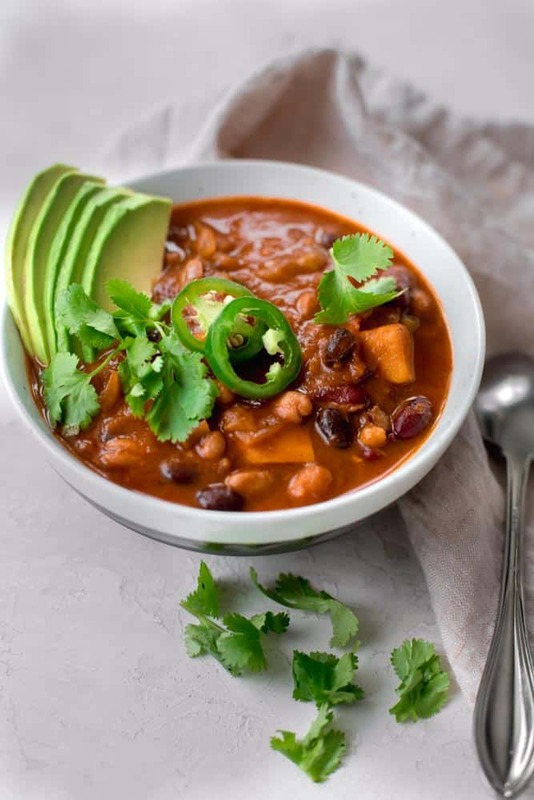 Say hurray to “Meatless Mondays” with this sweet potato chilli recipe that never fails to please any crowd. Or maybe you just want to have this on a random Tuesday, Or maybe you want to be like me and double the recipe and make it in that ginormous pot you inherited from your grandmother, so you can eat this sweet potato chili all week. Evenly chop the vegetables. 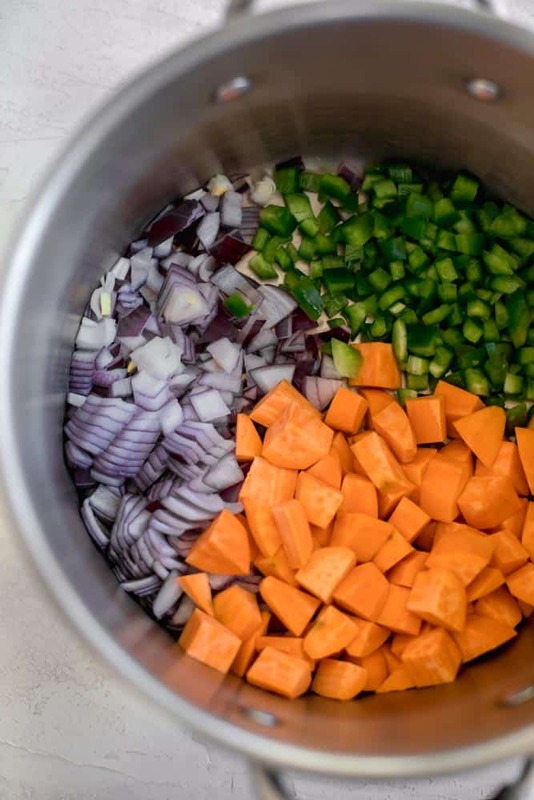 Each vegetable should be evenly chopped to make sure that they all cook efficiently and equally. This helps to make sure that each bite is consistent and no vegetables are undercooked. Be mindful of when you add the spices. The quantity of the spices matters and when they’re introduced in cooking process matters even more. For the best flavor, add the spies immediately in the beginning once the vegetables have slightly softened. If you wait until the end, you’re missing out on a lot of flavor. Don’t skip the toppings. The toppings for serving this sweet potato chili are just as important as the ingredients you used to make it. Add some acidity with a fresh squeeze of lime juice. Add a hint of freshness with cilantro leaves. Or make it creamy (and still vegan) with slices of avocados. These toppings all help enhance the flavor of the chili. Then, enjoy it with tortilla chips, corn bread of coleslaw. It’s possible that I have a biased opinion, but it’s the best darn chili recipe I’ve ever made (or even tasted…just gonna put it out there!). 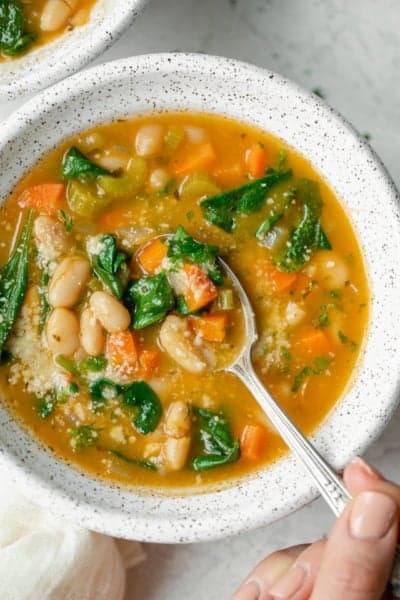 It’s hearty, healthy and makes the tummy happy on cold fall/winter days! If you make this healthy-ish feel good Sweet Potato Chili recipe, please be sure to leave a comment and/or give this recipe a rating! I would love to hear about your experience making it. And if you snapped some shots of it, share it with me on Instagram so I can repost on my stories! Add the red onions, sweet potatoes, bell pepper and garlic, season with salt and pepper. Stir to combine, and cook until the onions and translucent and the vegetables soften, about 5-7 minutes. Add the chili powder, smoked paprika, cumin and Mexican oregano and stir to coat the vegetables. 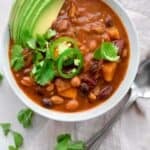 Pour the vegetable broth, diced tomatoes with their juices, chopped green chilis with their juices, followed by the black beans, kidney beans and pinto beans. Stir to combine and bring mixture to a boil. Cover the pot and reduce the heat to maintain a gentle simmer. Cook for additional 30 more minutes until all the flavors are well-incorporated and the mixture is thick. Add the lime juice, season with salt and pepper. Garnish with avocados and fresh cilantro, if desired. Make Ahead Tips: You can chop everything up to 2 days in advance. Sweet potatoes can stay chopped at room temperature or in the fridge without getting spoiled. Substitutes: For best results, follow the recipe as is. However you can switch up the beans though and some of the spices if you prefer. 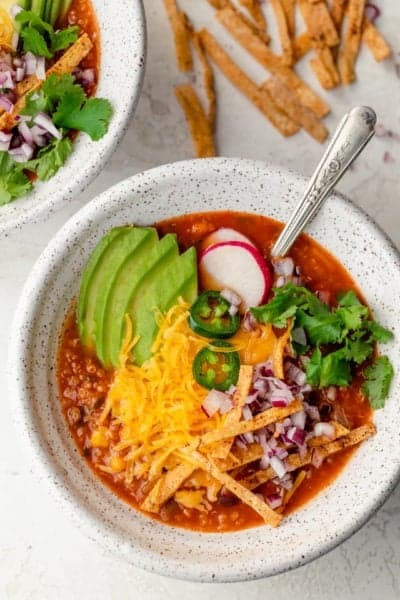 One of the most flavorful chili’s I have tried and made! I believe I like it more than an original beef or chicken chili. The best part is it was really easy to make and took me about 30 minutes. It was AMAZING!! All kids and husband loved it and can’t wait for leftovers ???? great job Yumna!! Thank you so much love! 🙂 Glad you enjoyed it! So earthy and delicious! I loved it!